Today’s masterpiece comes from Lien of Sacramento, who surprised her fiance with this Stormtrooper groom’s cake just before their wedding in September. Wowza. Every geek should be so lucky to have a Lien. 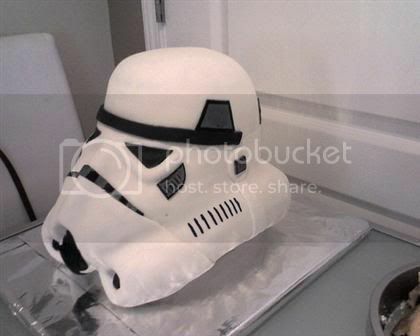 Check out the other Star Wars cakes here on Great White Snark. Lien created the details of the helmet with four separate pieces of fondant. On the inside, there’s cake (duhr), a lemon-flavored treat, and Rice Krispies. Rice Krispies seem to be pretty popular in these cakes. I wonder when some enterprising cake artisan will try an alternative like Cheerios. Or Count Chocula. 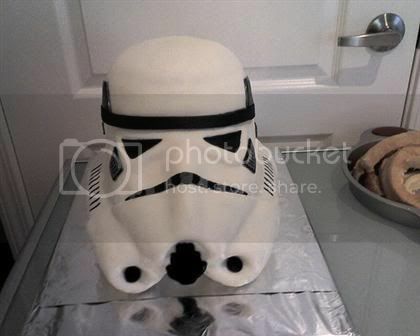 If you ask me why the cake is off-center in these photos, I’d guess it’s because looking directly at an Imperial Stormtrooper might compel you to turn over the plans stored in that R2 unit, give up the location of the secret Rebel base, swear your allegiance to the Emperor, and pee yourself a little. 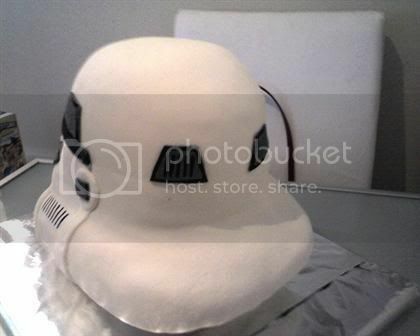 Lien tells me that she has lots of Star Wars fans in her family, and she started a side business making wedding and groom’s cakes in January, so we (you and me) have other impressive Star Wars cakes to look forward to in the coming months. In the meantime, you can check out her other novelty cakes in her Flickr photo set. awesome! din’t think i would see a cake like this, beautiful! Glad you liked it, Great White Shark!! I snuck off to my friend’s house to make this a couple days before the wedding and forgot my camera. These shots were taken on my treo, hence the quality or lack thereof. The bottom 3 inches was rice krispies because it supports and holds its shape much better than cake. Another geeky detail: We used the Imperial Death March as our recessional music – our guests loved it!! @Lien: the Imperial death march as recessional music! I am in awe of the geekiness factor of that, and of your pastry-wrangling skills in general. I think you mean, “surprised her fiance,” not “surprised her finance.” Although, in this economy, who knows. Cindi: Thanks, WordPress, for spellchecking that sentence right into nonsense. Make one of Chewbacca with Coco Pebbles inside. Now that one I would eat. Seriously awesome cake. I often wonder what stormtrooper brains taste like. Now I know: rice krispy treats.